Since our Santa Fe getaway, there are four things we just can’t get over. 1. We wish we were still living in a city that was surrounded by mountains. 2. We wish we lived closer to that amazing dog park. 3. We wish we had cooler weather. 4. We wish we had access to more green chiles. Since only one of the four “wishes” are in within my control, I decided to do what I could for the cause. So to recapture the spirit of New Mexico–and to rush the feeling of fall in South Texas–I made a pot of green chile pork stew. As it slowly simmered away on the cooktop and filled the house with an amazing aroma, it was also the very taste of nostalgia we needed. Blistery and charred chiles, browned chunks of pork and a few chopped tomatoes made this savory stew absolutely divine. The next day it was even better served over rice. And two days later it became breakfast topped with a fried farm fresh egg. 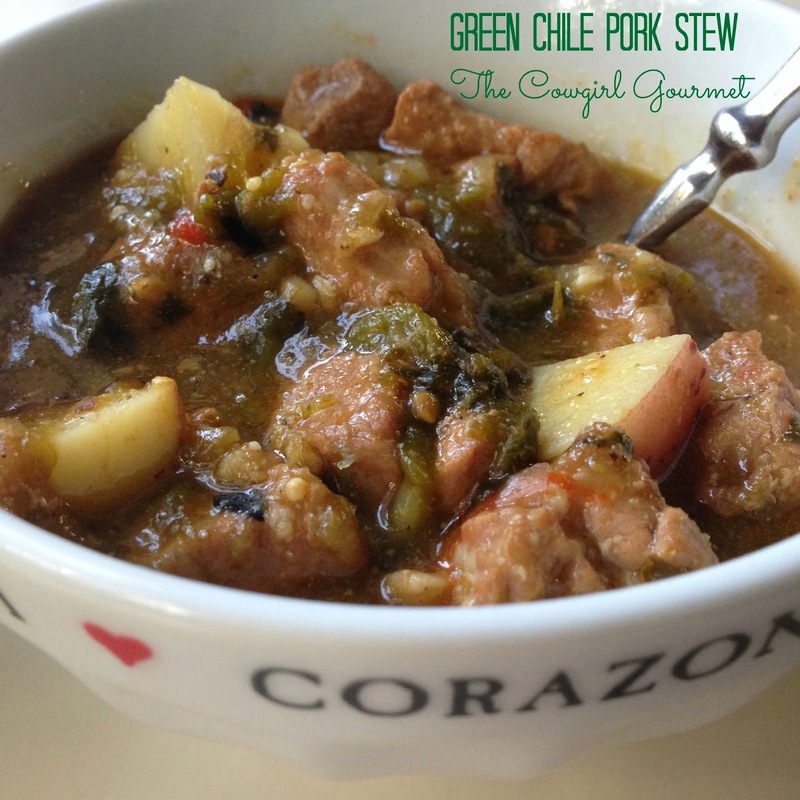 If you’re needing a quick getaway, but don’t have time to actually “get away,” stir up this green chile pork stew and I bet you’ll swear you’re in New Mexico. Place the chunks of pork in a big bowl and season generously with kosher salt and freshly ground black pepper. Heat a heavy bottomed Dutch oven or soup pot over high heat and add the olive oil. Add the pork to the pot and sear on all sides to a golden brown. With a slotted spoon, remove the pork chunks and place on a platter. Lower the heat to medium high and add the onions, cooking until soft, about 3 minutes. Add the garlic and saute another 2 minutes, just don't burn the garlic. Add the tomatoes, cumin, oregano and stir well to combine. Add the roasted chiles and tomatillos, stock and pork to the pan, stir well and bring to a simmer. Cover the pan with a lid and cook slowly for 2 to 2 1/2 hours. While cooking, stir occasionally and add a little more water if needed so the stew is always covered. When the pork is perfectly cooked for you, add the diced potatoes and masa harina stir well. Allow the stew to simmer another 15-20 minutes so the potatoes are tender. Ladle in bowls. Garnish with fresh chopped cilantro, a dash of Maldon salt, eat, repeat. To roast chiles, place washed peppers and tomatillos on an aluminum foil lined baking sheet and place under the broiler on high until they blister and char. Turn and allow to blister and char on the other side. When completely charred--be aware that the tomatillos and jalapeno or serrano will blister quickly--remove from the oven and place in a glass or big bowl and cover with plastic to sweat the skins off. Let sit for 10-15 minutes. Now the blistered pepper skins should come right off. Remove the stem and seeds, rinse lightly if needed and roughly chop.